Russia has denied interfering with the U.S presidential elections after Hillary Clinton campaign /Democratic party emails were hacked. Wikileaks' Julian Assange released series of hacked emails potentially damaging to the Clinton campaign which made the Clinton campaign and the White House immediately release statements blaming Russia for the hacks with the White House promising to give a 'proportional' response instead of denying the contents of the mails. The hacked mails reveal that the Clinton Campaign shared information with the U.S Department of Justice as regards her 36,000 mails deleted from her private server, the mails also show her supporting open trade deals but criticize open trade deals in public during rallies. The mails also reveal that Hillary Clinton chose her running mate Tim Kaine over a year ago and not as recently as she made the public to believe. Wikileaks Julian Assange has reportedly promised to release more mails in the coming days but Russia's foreign minister Sergey Lavrov has denied Russia's involvement in America's political sphere. In an interview with CNN's Christiane Amanpour in Moscow, Lavrov said it was "flattering" that American officials think Russia is meddling in the election, but the accusations were baseless. regional power, as President Obama called us some time ago," Lavrov told CNNon Wednesday. "Now everybody in the United States is saying that it is Russia which is running the [U.S.] presidential debate," he said. "We have not seen a single fact, a single proof." "There are so many p**sies around your presidential campaign on both sides that I prefer not to comment." Asked about this threatened response by the American government on Russia for the email hacks, Lavrov said: "It's not worth, I believe, speculating. If they decided to do something, let them do it. But to say that Russia is interfering in the United States' domestic matters, is ridiculous." Many Americans, since the mail leaks, have called on Hillary Clinton's campaign chairman John Podesta to resign but he said it was "a reasonable conclusion, that… the Trump campaign had advance warning about what Assange was going to do." ''WikiLeaks seems to be doing everything they can on behalf of our opponent,"
Russia's president Vladmir Putin has also revealed that influencing the American election is not one of Russia's interests. 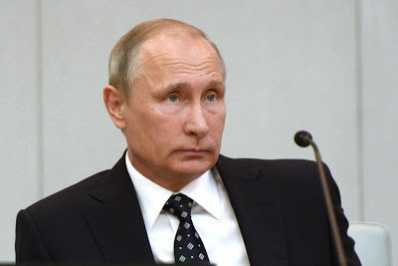 Russia, but there is nothing within the interest of Russia," Putin said, speaking at an investment forum in Moscowon Wednesday. Putin said he didn't see why Russia was a "main issue in the election campaign," and that it was "gratifying but puzzling." In a joint statement, the Department of Homeland Security and the Office of the Director of National Intelligence said the intelligence community is "confident" the hacks and documents published by WikiLeaks and DCLeaks.com and those claimed to have been carried out by a hacker known as Guccifer 2.0 are "consistent with the methods and motivations of Russian-directed efforts." "These thefts and disclosures are intended to interfere with the U.S. election process. Such activity is not new to Moscow – the Russians have used similar tactics and techniques across Europe and Eurasia, for example, to influence public opinion there," the statement reads. "We believe, based on the scope and sensitivity of these efforts, that only Russia's senior-most officials could have authorized these activities." "It would be extremely difficult for someone, including a nation-state actor, to alter actual ballot counts or election results by cyber attack or intrusion," they said. "This assessment is based on the decentralized nature of our election system in this country and the number of protections state and local election officials have in place."